Will Google Auto Ads make you more money? In depth review of Auto Ads earnings. Will your website/blog make more money, if you use Google’s Auto Ads? We conducted a 40 day split testing experiment, comparing Auto Ads to Fixed Ads displayed by our AdSense plugin for WordPress! The results – Google Auto Ads made 38% LESS revenue! What is the hype with Auto Ads? Google states: “AdSense Auto ads is a powerful new way to place ads on your site. Set it and let Google do the rest”. If you think about it, its a pretty incredible innovation. You don’t have to spend time and energy to figure out how to monetize your blog or website. Using artificial intelligence Google scans a particular page on your site and figures out which type of ad, what size, as well as where it should be placed to maximize revenue. In fact, ad placement is the newly added bonus, since Google Adsense was largely automated anyways. Many web masters, and especially ones who are just starting out, are confused about where to place the ads on their pages, in order to make more money. 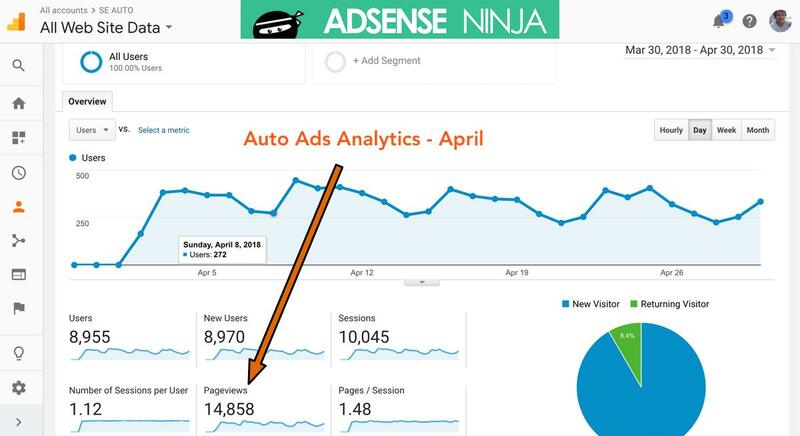 So auto ads essentially takes care of this challenge and allows many more bloggers to sign up with Adsense. Moreover, the system is supposed to adjust and improve ad placement as it gathers performance data from your pages. Ultimately, this gives website owners the opportunity to focus a lot more on creating quality content and improving their online services, without having to worry so much about monetization. Since Google Auto Ads has such incredible potential, we were excited to see whether it can actually earn more money, compared to going through the trouble of inserting and optimizing ads on your own. After 40 days of testing, we can definitely tell you that if you properly optimize ad placement and ad sizes yourself, you can (and most likely will) make more money, than if you rely on Google’s machine learning AI. Before we jump to analyzing the results of our A/B test, it’s important to discuss methodology – how the test was performed. Also, note that AdSense does not have proper Auto Ads performance reporting. This makes it very difficult to get accurate results. Moreover, WordPress is not an ideal platform for running these types of experiments. However, with a lot of manual configuration, we managed to have 2 identical WordPress Themes setup to show on 50% of the page views. One with Auto Ads (Variation A), and another with Manual Ad placements (Variation B), set up in the same way as it was, before the test began. To split pageviews and ad impressions between Auto Ads and Manual ads, we used A/B Theme Testing (it is made by Aaron Edwards). Each identical WordPress theme had about 50% of page impressions (views), served by AB Theme Testing at random. This means that each site visitor saw only one ad variation! We modified the plugin to have 600 seconds “cookie expiration” time, so that each visitor would see only Auto Ads or Manual Ads. We used a modified Point theme (free version) with most options disabled, and some CSS/HTML modifications to remove unnecessary page elements. We ran the test for 40 days, and the entire website had about 41,577 pageviews (reported by AdSense). AUTO ADS: We placed Auto Ads snippet in the header.php file of Variant A, between <head></head> tags. MANUAL ADS: we used AdSense Ninja WordPress plugin to place ads above and below content, as well as in comments – after every 10th comment on each page (note that Auto Ads also places ads in comments, which we took screenshots of). Additionally, we had ads inside content, about 4-5 paragraphs down, manually placed by [adsenseninja] short-code. As I mentioned earlier, it’s fairly easy to measure income from Auto Ads, because of the way Google implements them. There is (currently) only one way to see the revenue from Auto Ads. Select the Ad Formats report, and then add the Site, which you want to track. Unfortunately, there is no Custom Tracking Channel available for Auto Ads. Got to Performance Reports inside AdSense dashboard. At the top, where it says Report Type > Days, click down arrow, and select Ad Formats. Where it says Filter, select your Site, where you ran Auto Ads. Basically, every ad format that is not In-Page is an Auto Ad type. You select which ones you want to run when you initially setup up auto ads on your site. 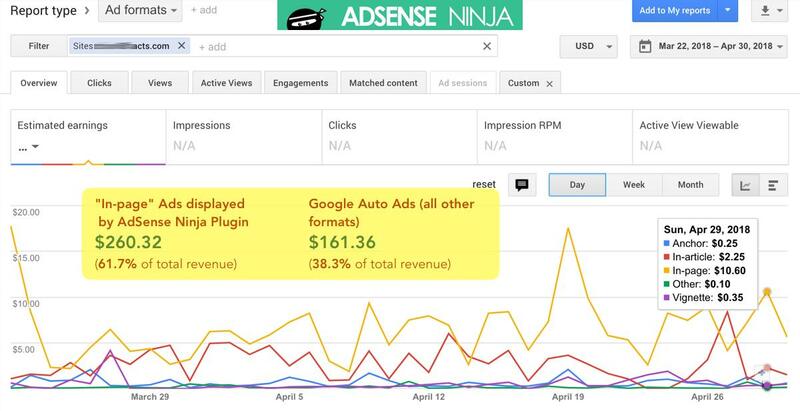 Here is a screenshot that shows the total combined ad revenue for both Auto Ads and Manual Ads. As you can see from the graph, “In-page” format (manually placed ads) earned $260.32, while Google’s Auto Ads made $161.36 during the same period, with equal number of page views. If we take the total site revenue of $421.68, then we can see that Auto Ads earned only 38.3% of total. Manually placed ads made 61.7% of all revenue for the duration of the experiment. From this graph you can see that Manual Ads earned more money nearly every day of the experiment, with only 3 exceptions (3 days), when Auto Ads made more. Now let’s look at performance of Manual ads on this site, to confirm that “in-page” ads are in fact manually inserted ads, and are not somehow mixed into the Auto Ads. Here is a line graph report for “all inclusive” custom channel that tracked all manual ads during this experiment. Note that I made a mistake and did not include “Desktop Comment Ads” into “SE – MANUAL” tracking channel until late into the experiment. That’s why custom channel shows $242.55, whereas “in-page” ads shows $260.32 … We are missing about $18 here. 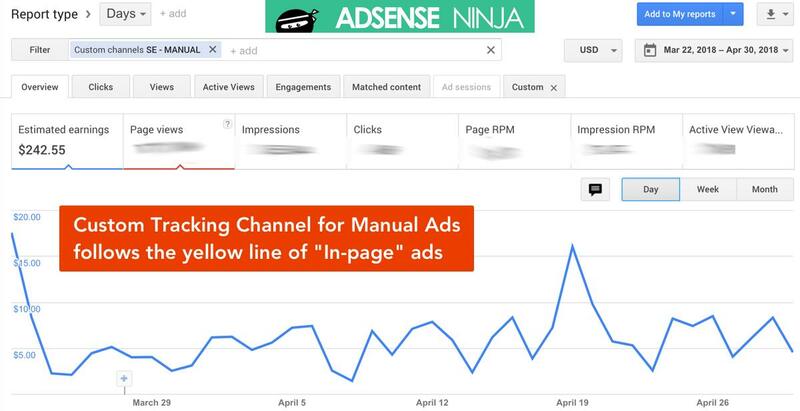 Finally, here are Google Analytics for both Manual and Auto ads theme. Note – I did not setup Analytics until April 2nd. That’s why you see zero traffic on March 30, and April 1. However, the page views for each variation are within 2% (14,858 for Auto Ads vs 15,178 for Manual Ads) which is negligible, when we consider 61% difference in earnings! Once again, page views for both versions were nearly identical in April. Unfortunately, I do not have data for the end of March. However, we assume that since AB Theme Testing plugin did its job just fine for 29 days, March stats are the same. I like to play the “what if” game. What if I used Auto Ads (continued to run my experiment) for 12 months straight. How much would I lose? I did some calculations. If I ran the 50/50 split for 12 months, and assuming traffic would stay the same, I would lose around $903! If I ran ONLY Auto Ads for 12 months, I would lose $1782. These numbers are based on a little spreadsheet that I made. Conclusion – with Auto Ads you are losing money! I don’t want to beat the dead horse anymore, but from 40 days of testing, we can clearly see that I lost 38% of revenue ($98.96) during this experiment, and my manual ads earned 61% more. While I take into consideration that my ad optimization is somewhat better than most people’s who will read this, most web masters / bloggers should be able to get at least 25-30% better results by using fixed size ad units. While so far the success of auto ads has been rather mixed, it is important to remember that this is a rather new Adsense feature. As more bloggers sign up for the service, Google will have more information to further improve the performance of its auto ads. 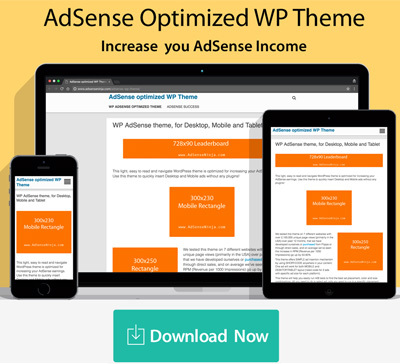 Its highly possible that in a few years, auto ads will outperform manual ad placement efforts, as well as existing WordPress Plugins for Adsense. For now, I recommend running tests, similar to the one I described above, to see what would work best for your website. adsense auto ads provides poor experience to blog users. it will quit it. I agree about poor experience – Auto ads look pretty bad, and you also lose a bug chunk of revenue. I actually ran a follow-up 60 day test on the same website, and results are dearly the same – fixed ads beat auto ads by 57% over 2 month period. 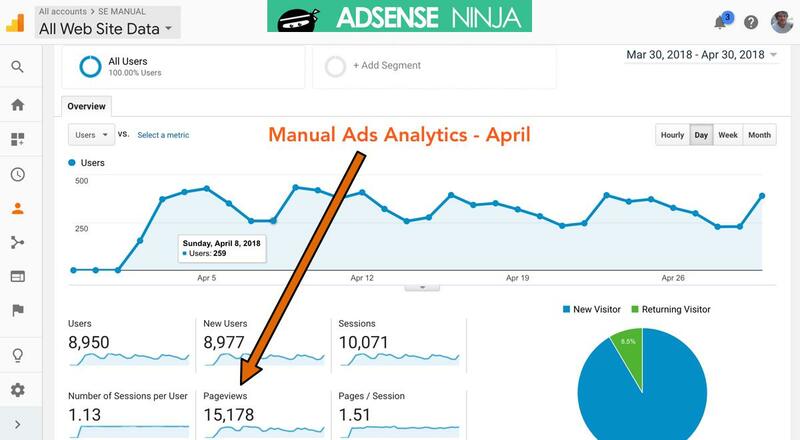 Do you run a lose if you mix both manual and auto ads. Can I run a lose if I mix the two, because auto ads are pretty good at placing ads in content than other places. I don’t run Auto Ads at all, because A) as you can see from this case study, it makes much less that manually placed ads, and B) I cannot control where Auto Ads might show on pages, which can cause conflicts with style, layout and ad placement. If you mix auto and manual ads, you may have a situation, where 2 ad units are one right after the other, which is bad user experience. I do all placement of ads with my plugin, and it works out very well for me and others! My plugin can put ads in content – you give it an order – display ads after X number of paragraphs, and then you can repeat that ad. For example, first in content ad may be placed on every post/page after 3 paragraphs, and repeated 2 (3, 4 or more times) … So if I set it to repeat 2 times, ads will show after paragraph 3 and 6. That is what I typically do. I try to not have more than 4-5 ads per page. I noticed the same thing and that’s why I saw your post here. Really great AB testing and give me more confidence that Google Auto Ads do really perform poorly. 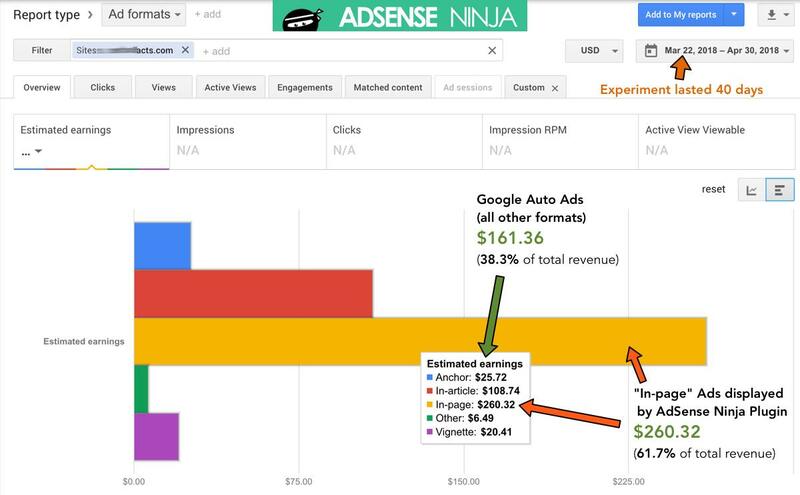 Thanks for sharing this informative blog post about Google’s Adsense Auto Ads and your A/B testing wit AdsenseNinja. I would not recommend anyone using it on a website as a monetisation strategy indeed. Your post is quite helpful. 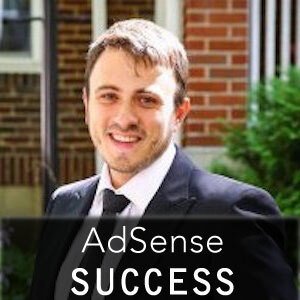 Why would you NOT recommend Adsense as monetization strategy? It makes no sense. Great post man. I have a question. Which ads best in-article, texts…or? IF multiple at what ratio? You CAN combine Auto Ads with manual ads. Auto ads may add 2nd ad above the fold and into sidebar. This will make your site look weird at best. Auto ads will most likely place a 728×90 banner in your site header. Auto ads in content, tend to be placed toward the bottom of the page, which will reduce ad impressions (active viewable %), and lead to low revenue. I believe, placing ads 100% manually will produce much better income overall. It takes no more than 30 minutes to create and place ads EVERYWHERE on your site, with the right tool. And wile the right tool is not free, with decent site traffic, you should recoup the cost in 1-2 months, and start earning much more thereafter. I’d be more inclined to use if there was a free trial beforehand. If I saw a revenue increase and it was worth the $179 but I wouldn’t pay that beforehand to regret it later. Thanks foe your input. I understand your desire to fisrt see if this plugin works. However, it would be very cumbersome from technical standpoint to creat a trial version of this plugin. So at this point I would suggest looking at some case studies on our adsense YouTube channel. Finally, some websites are already well optimized (thought this is rare), and our plugin might not be as effective as in most cases. Bottom line – as they say on TV: “Individual Results May Vary” and much depends on how you use it. We give you all the tools to quickly deploy AdSense across your website with maximum visibility, and EASY way to set up quick AB test to find which ads work best for your website. Now if one doesn’t take advantage of all these options, one cannot then say, that plugin was ineffective.